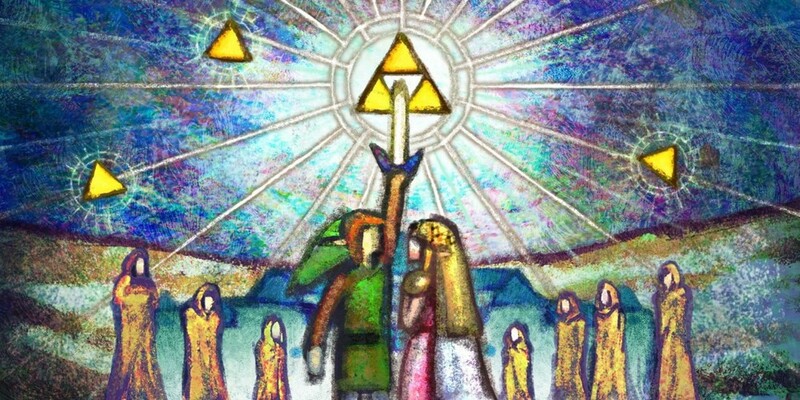 For years, most conversations about Zelda games have been dominated by talk about the Zelda formula: a set of structural rules that the games have slavishly stuck to since 1991’s A Link to the Past. A Link Between Worlds promised early on that it was going to change all that. In Japan, it’s called A Link to the Past 2. It’s making a pretty clear statement that this is the next step for Zelda. Well, two steps forward and one step back, but you know- a step nonetheless. Let’s start with the steps forward, since the rest doesn’t quite make sense without them. Pre-release info has made a big deal of the game’s item rental system. Instead of getting each item in its own dungeon, Link instead has access to almost every major item after the first dungeon. A shopkeeper sets up in Link’s bedroom and lets him rent bombs, the bow, a boomerang, a whole stable of Zelda staples. You keep these items until you die, unless you buy them for a high price, but purchased items can also be upgraded though a surprisingly deep and enjoyable side quest. If you play smart though, you could probably get through the entire game on just one rental. The loss of items and rupee requirement to getting them back adds some actual tension to boss fights, since death leads to more than just losing your last five minutes. Seriously, this is breaking and entering, and also extortion. I should be beating up THIS guy. Unfortunately, the game’s bosses aren’t quite up to snuff for the most part, but 2D Zelda games aren’t really combat-focused games, they’re about the puzzles. 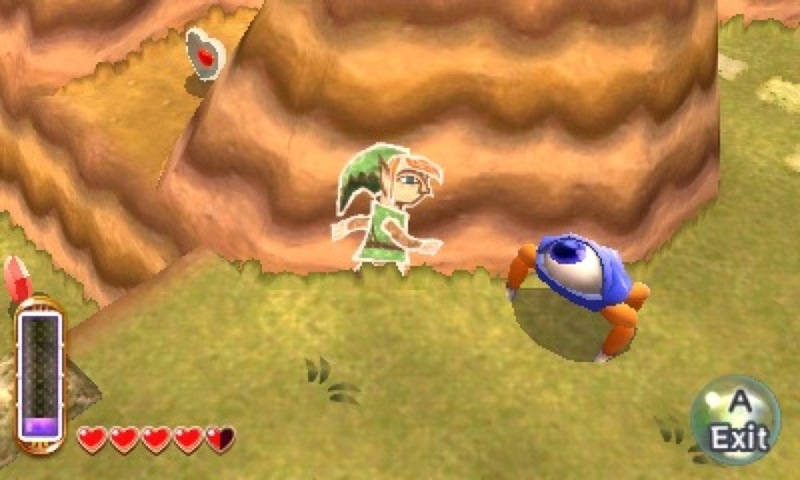 LBW adds two tools to Link’s repertoire in that regard. The first is his newfound ability to merge into walls. It basically amounts to being able to sidle along any wall, but it does make a bigger deal than you’d expect it to. Finding secrets hidden around walls you didn't expect to be able to traverse is very satisfying. Like how Portal managed to teach me to “think with portals”, I eventually started looking at every wall and trying to figure out if something was hidden around the other side. The other new trick is the addition of height to dungeon layouts. Rendering the game in polygons let the designers go hog wild with multi-layer dungeons, height puzzles and just overall deeper, more interesting puzzle design. A third axis really does help for making puzzles more than “light two torches, chest appears.” Of course, that puzzle still shows up, but it disappears early on to make way for sand manipulation, ice-seesaws and other more interesting mechanics. Those springs are awfully happy for things that stepped on a lot. The trade-off for height, however, is the fact that everything looks sort of ugly. LttP has a very unique look, with muted colours and simple shading used to create the illusion of detail where there was none. It’s not a mind-blowing effect, but when you look at a random screenshot of LttP, you instantly know what game it’s from. LBW tries to replicate that effect, but it comes off looking cheap. Characters don’t quite have the same pop, even if they do look ostensibly identical, and in some areas, everything just comes out looking like RPG Maker clip art. It’s not good. And unfortunately, it invites comparison, because both Hyrule and its mirror counterpart Lowrule (this game’s version of the traditional Zelda Dark World) are ripped straight out of LttP. It’s an almost pixel for pixel recreation, with some slight changes here and there. If you’ve played LttP, you’ve been to this Hyrule before. From the field of pillars near Link’s house to Thieves’ Town, everything is more or less how you remember it, but rendered in plasticky polygons. Like the graphics, it feels cheap, especially from a team that’s proven they can do better many times before. They chopped down that tree in the last 22 years. Pogress! Lowrule's Princess Hilda is rocking that gothic-upside-down-zelda-without-a-hint-of-irony look that's so chic in her kingdom these days. But, in another step forward, the world is totally open. Since every item is accessible to you from close to the start, the world is completely traversable, save for a few areas that need optional items you’ll get from exploring to open up. All this means you can tackle most of the dungeons in whatever order you please. After the first dungeon, you tackle one of two dungeons before the other, and after those, seven more dungeons open up to be explored in any order. I even found myself getting halfway through one dungeon, finding myself stuck, and then warping out to check out another one. The game’s pace is totally up to you. You can explore for hours before setting foot in a dungeon, or you can take them on one after another in rapid succession, ignoring side quests. It’s perfectly suited for a handheld game and a welcome relief from Twilight Princess’ slow build up between dungeons, and Skyward’s Sword’s movie-length tutorial sequence. All the non-linearity, clever puzzles and occasional multiple solutions led me to feel something I haven’t felt from a Zelda game in a while: accomplished. It’s satisfying to get somewhere you feel like you shouldn’t be yet, and still triumphing through smart play. Dungeons don’t ramp up in difficulty but focus on more and more devious puzzles for the item they focus on. It’s just unfortunate that such a huge step forward had to be coupled alongside such a massive step back. Reusing the overworld really hurts the game more than I expected it to. Every dungeon occupies the same spot on the map; the insides are just different, same with every house, cave and lake. Exploration is promoted, and while there are new secrets to discover, I can’t help but feel I’ve done all this before. For all my hatred for the polygonal graphics, the 2D wall paintings look fantastic. A+ to that part of the art team. It’s funny, “I’ve done this all before” is probably the number one complaint about Zelda games since 1998’s Ocarina of Time. Every game since LttP has just recreated its structure with slight modifications. Finally, there’s a game that actually shakes up the formula, but it feels same-y for a completely different reason, and it still holds it back. There were moments when LBW reminded me of expertly game mods. Like Super Smash Bros. Brawl’s Project M, or Half Life’s Counter Strike, LBW radically changes certain things about the game it originated from and freshens up that experience, but it’s still being built on that foundation, and you can’t change the underpinnings. The changes it does make are great. The game is fantastically fun, doesn’t hold your hand and is clever throughout. But all of that is at odds with the reused overworld and cheap-looking graphics. It’s one of those odd games that does so much right, but fails to seal the deal the way it should. If only the game sprung for a new overworld, to really reward the exploration it encourages with something new and exciting, it would be the best Zelda game in years. And if you've never played or aren't super familiar with LttP, it might be. But for the Zelda diehard, it seems to be comfortable simply being good, never quite escaping the shadow of its predecessor.